The discovery of this ancient strain of blue-green micro-algae Aphanizomenon flos-aquae (AFA) has led to a new super food that contains more protein and chlorophyll than any other food source. 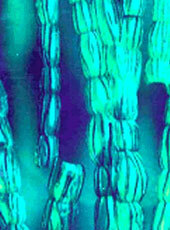 Primitive as algae may appear, most are highly efficient photo synthesizers, even more so than plants. Algae utilize light energy from the sun, carbon dioxide from the air, and hydrogen from the water to synthesize proteins, carbohydrates and lipids. AFA grows only in the wild and is far superior to any other algae on the planet. It is nature's perfect food. AFA is unique among all food grade algaes in that it also metabolizes molecular nitrogen from the air to produce its proteins and other nitrogen containing bio-molecules. The AFA cell is truly awe-inspiring. Although hundreds of times smaller than the cells of the plant or animal kingdoms, its wide range of sixty-four micro-nutrients is remarkable and unsurpassed by any known food. It should be no surprise that the nucleic acids of AFA also bio-stimulate the immune system. Our E3 AFA is a non-GMO heirloom variety. Is all AFA algae the same? The benefits of Aphanizomenon flos-aquae are directly proportional to the quality and exact source of the algae. Unless you know the source of the algae, there is no guarantee of quality. AFA has been harvested from the purest and healthiest algae from the deepest waters of Upper Klamath Lake. We harvest from the deepest waters of Upper Klamath Lake to bring you the purest, healthiest and most potent algae available. The brain is the most undernourished organ in the body. Although it comprises only 2% of the total body weight, it uses 20% of the body's available energy resources. Each of its estimated 10 billion neurons has an insatiable appetite, which must be satisfied every minute of every day of our lives. AFA metabolizes molecular nitrogen directly from the air. This growth pattern allows for the biosynthesis of Low Molecular Weight Peptide Groups. These low molecular weight peptides are the precursors of neurotransmitters, which are used by various regions of the brain and body to initiate the secretion of other substances (such as hormones) that influence metabolic functions. Neurotransmitters can be seen as the chemical link whereby neurons communicate with one another. The ability of the brain neurons to manufacture and utilize neurotransmitters is dependent upon the concentration of amino acids in the bloodstream. This largely depends upon the food consumption of the previous meal. All of the body's basic biochemical processes require energy to occur. It is from the ingestion of various food substances that the required amount of energy is obtained. The central part of the body's energy package that provides for the replication and repair of cells, organs and organ systems is protein. Next to water, protein is the most abundant substance in a healthy human body. It comprises a major portion of the blood and lymph and creates a natural immunity by giving the body a means of recognizing invading foreign cells and viruses. Proteins are made up of amino acids, which are the building blocks of the body. Proteins comprise 90% of the hemoglobin and form the backbone of the body's immune system. AFA contains more protein than any other organism (plant or animal). There are 22 amino acids, 8 of which are essential and must be obtained from our foods. Without proper quantities of all the amino acids, health cannot be maintained. When improper amounts of amino acids are consumed, the less important body tissues are "cannibalized" causing premature aging and possible severe deficiencies, such as lack of motivation, loss of memory, low mental alertness, poor intellectual performance and depression. What is truly unique about the algae is that its amino acid profile is almost identical to that found in our body, making AFA one of nature's perfect foods. Research has shown it's not only what you eat, but also what your body absorbs and assimilates that is important. Micro-algae, existing at the beginning of the food chain, provide nutrition in its simplest form balanced whole food nutrition that is easily digested and absorbed. AFA has a soft cell wall that is easily digested by the body. This allows rapid absorption of vital nutrients and easy assimilation. This algae, harvested from the wild in its 100% organic natural state, comes to you directly from southern Oregon's extraordinary Upper Klamath Lake. The lake is far away from any large cities that might pollute the air and water, and it is also entirely surrounded by the Cascade Mountains. This unique ecosystem of mineral-rich water, clean air and high intensity sunlight makes Upper Klamath Lake the perfect growth medium for this nutrient-dense whole food. Aphanizomenon flos-aquae from Klamath Lake is the very best that algae can be. It is the most fundamental food on the planet. There is simply nothing else like it. Algae has been harvested and eaten for centuries and yet, until recently, its immense nutritional value has mostly gone unrecognized. Now, science has begun to focus their attention on the nutritional potential of algae because of global hunger, shrinking resources, depleted lands, etc. The results of this research and testing have been impressive enough for UC Irvine scientists to call it a "Super Food, capable of contributing to the achievement and maintenance of wellness." Chlorophyll is a very important part of the algae. Its molecular structure is almost the same as that of hemoglobin, which is responsible for carrying oxygen throughout the body. Oxygen is the prime nutrient, and chlorophyll is the central molecule for increasing the oxygen availability to your system. Chlorophyll is vital for the body's rapid assimilation of amino acids. Algae is the highest known source of chlorophyll. * As with any wild-harvested food, chlorophyll content may vary depending on the growing season, time of year, and environmental factors. Vitamins are essential to human life. They are organic compounds necessary in small amounts to promote growth and maintenance of life. They do not provide energy, nor do they construct or build any part of the body. They are needed to transform food into energy for the body. AFA contains a complete balance of vitamins except for vitamins "D" and "E". Spending time outdoors in the sun provides a source for vitamin "D", where it is formed in the skin by ultra violet rays. 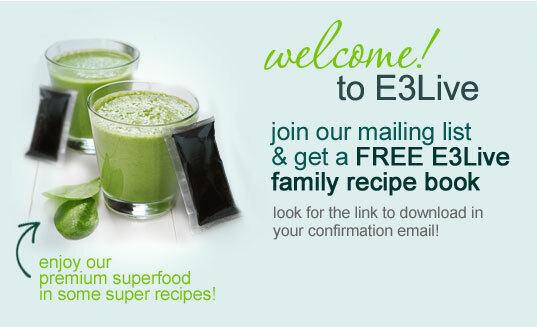 Eating high chlorophyll foods helps produce vitamin "E" in the body. Minerals are important to the overall functioning of the mind and body. They have two general body functions - building and regulating. Without minerals, vitamins have no function. Minerals help build the skeleton and all soft tissues, and regulate heartbeat, blood clotting, internal pressure of body fluids, nerve response and oxygen transport from the lungs to the tissues. AFA contains almost every organic mineral in trace amounts, which is what the body must have to function well. Minerals can literally mean the difference between good health and serious disease. While the minerals only represent about one percent or less of our daily food intake, without them we cannot utilize our food, and we would quickly perish. The body uses beta-carotene to produce its own Vitamin A. Because the body converts beta-carotene into Vitamin A only as needed, there is no threat of toxic build up. The beta-carotene in AFA is probably one of the most powerful natural antioxidants known today. It may well be the single most important factor towards enhancing the immune system (by protecting the thymus gland) and thus increasing our life span. However, the potential healing properties of beta-carotene are maximized ONLY when other precious carotenoids are also present. AFA contains dozens of carotenoids, all able to neutralize the deleterious effects of dangerous free radicals. In the past 25 years, twenty-four worldwide studies have looked at beta-carotene. All findings are consistent. Leading degenerative disease research authorities have shown that people who consume higher-than-average amounts of foods rich in beta-carotene have lower incidence of degenerative disease. We can go without food for weeks but without water we die of dehydration in a few days. Over two thirds of our body is water, yet most of us don't clearly understand the importance of drinking pure water (no chlorine, no chemicals, no bacteria or carcinogens). Water is the most abundant compound in the human body and is necessary for: Digestion of food; Regulation of body temperature; Transport of food to the tissues; Elimination of toxins and body wastes; Circulation of body fluids (like blood and lymph); Lubricant in the joints and internal organs - keeping them moist; Permitting the passage of substances between the cells and blood vessels. Water is part of the blood system holding dissolved minerals, like calcium and magnesium, in solution and making them available to body tissues where they are required for proper health. When water consumption is limited, the body robs some areas to protect different tissues and organs, which results in pain, tissue damage, and a variety of common health problems. All too frequently we tend to confuse thirst with hunger and instead of drinking water, we eat, leading to weight gain. Your body needs a minimum of 1/2 ounce of pure water, per pound of body weight, per day. America's food supply is highly refined, processed, genetically altered and nutrient deficient. All of these factors negatively affect our bodies over time. It is very difficult to eat and stay healthy on the typical American diet. Over production of our farmlands have depleted the soils, causing our foods to be nutrient deficient. Most of the major degenerative diseases are largely caused by poor diet and unhealthy foods. Dr. Stanley S. Bass, N.D., D.C., Ph.C. says, "The closer the food comes to the natural state in which it occurs, or the closer we come to its raw, unfired form, the higher its quality is." In this condition, all the enzymes are found intact. The amino acids are in their finest form. The minerals, vitamins, trace elements, carbohydrates and life force are present. This life force is, in turn, capable of reproducing tissue, which is full of life and longer lasting in structure. Eating organically grown unprocessed foods, fruits, vegetables, nuts and seeds provides your body nutrients that are free of herbicides, pesticides and preservatives. Aphanizomenon flos-aquae is nature's most basic food. It exists at the beginning of the food chain, provides perfect nutrition and contains more protein than other whole foods. This super nutrition provides rich naturally occurring Chlorophyll. Chlorophyll has been shown to enhance your entire health and boosts the immune system. This amazing food can also help to purify the blood, promote intestinal regularity and naturally help heal the body. Good nutrition is the first step toward a long and happy life! For specific nutritional information, please call 888-800-7070.